The Distinguished Service Award is Kansas Agribusiness Retailers Association’s most prestigious award given annually to recognize someone who has made a significant and notable contribution to our industry and/or our association. The contribution may be of scientific achievement, marketing, engineering, transportation or management, but it is not limited to these specifically. Mike Shirley (left) presents the 2018 Kansas Agribusiness Retailers Association Distinguished Service Award to Kevin Brady at the association’s annual meeting in Manhattan. The oldest of seven children, Kevin grew up in southeast Kansas. He graduated from Pittsburg State University in 1990 with a bachelor’s degree in automotive technology and an emphasis in ag and heavy equipment. Kevin immediately began a job with Ag-Chem Equipment as a territory field service rep., traveling in Kansas and heading west into Colorado, Wyoming and New Mexico to service and repair TerraGators (Pre RoGator). In 1993, Jerry Martin hired Kevin to stay closer to home and be his sales assistant covering eastern Kansas for Ag-Chem Equipment, selling the RoGator and TerraGator product lines. In 1996, Kevin was promoted to a full ag-chem salesman and covered western Missouri and Eastern Kansas. When AgCo purchased Ag-Chem in 2001, Kevin continued as an area sales manager until the company switched to a dealer sales model. Kevin then went to work for Martin Farm Power and eventually wound up at Lang Diesel Inc., covering eastern Kansas and southwest Missouri. Kevin was encouraged early on by Jerry Martin to get involved with Kansas Agribusiness Retailers Association and learn about the organization and to network with industry leaders. Kevin heeded the advice and joined several committees and was appointed to KARA’s board of directors in 1997. In 1998, Kevin made history as part of the inaugural Tomorrow’s Agribusiness Leaders class. Kevin dedicated nine years on the KARA board and stepped down for a short year before being persuaded to serve on the KARA executive committee in 2011, completing his service to the board as chairman in 2017. 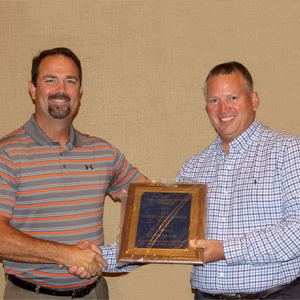 Kansas Agribusiness Retailers Association awarded its members a variety of awards from 1963 until 1988 when the Agri-Business Service Award, Education Service Award and Communications Service Award were combined into the Distinguished Service Award. 1968 | Leon F. Baker Jr.
1968 | Roscoe Ellis Jr.
1981 | Raymond Wary Jr.